If you’re zipping along on Lake Shore Drive, especially if you’re headed north, slow down just past Diversey Boulevard and look toward the lake. You may see a small monument of a Native American family – father, mother, baby and dog – staring back at you. 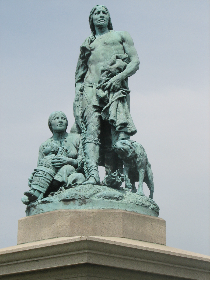 The sculpture is entitled “The Alarm” and most experts agree that it is the first sculpture in Chicago to portray Native Americans, having been unveiled in 1884. Like several other sculptures in the Lincoln Park and Lakeview area, the piece has been uprooted from its original placement, a more elaborate grouping, and now rests in an open area just off the bike path. Born in 1852, Boyle was educated at the Franklin Academy and the Academy of Fine Arts in Philadelphia, continuing his professional education at the prestigious Ecole des Beaux Arts in Paris. He was invited to participate in the largest artistic effort of the nineteenth century, sculpting pieces for the Transportation Building at the 1893 World’s Columbian Exposition in Chicago. 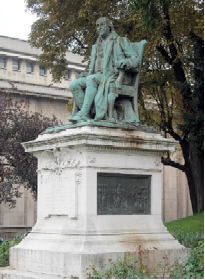 Three years later Boyle was chosen as one of the 23 sculptors to create works for the Congressional Library in Washington, D.C., where he created the statues of Plato and Sir Francis Bacon. Other notable Boyle works can be found in Philadelphia, including the sculpture of Benjamin Franklin in front of College Hall at the University of Pennsylvania. As is the case with so much sculpture in the city, a wealthy Chicagoan, Martin L. Ryerson, donated the funds for “The Alarm” in 1884. Ryerson was another one of those early Chicagoans who began life with almost nothing and made a fortune from a combination of shrewdness, timing, and hard work. In 1843 Ryerson began to produce lumber on his own, drawing from the immense stands of white pine in Michigan. By 1846 he had lumber interests in Muskegon, Kenosha, Wisconsin, and Chicago. Before moving on to real estate, Ryerson had made almost three million dollars in the lumber business. In the right place at the right time, Ryerson began to develop property in what is now Chicago’s Loop just as the Illinois and Michigan Canal was being finished and the railroads were making Chicago into the fastest growing city in the country. 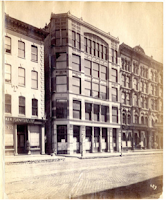 One of his later projects can be found on the east side of Wabash, just south of Madison Street, where in 1882 Ryerson commissioned Dankmar Adler and Louis Sullivan to design a building for the S. A. Maxwell Company. [History of the Development of Building Construction in Chicago] Located at 15-19 South Wabash, you can lease space in the building for ten bucks a square foot. Moving back to the sculpture that Ryerson commissioned in Lincoln Park, we can see that as he looked back on all that life had brought him, he thought fondly of those early days. The inscription on the base of “The Alarm” reads, “To the Ottawa Nation of Indians, my early friends." His memorial was designed by Louis Sullivan.